CLEARFIL PHOTO CORE PLT is the 5-Star award-winning light-core core build-up material now in a compule dispensing format. A heavily-filled hybrid composite, Photo Core PLT is radiopaque, does not stick to instruments, and cuts like dentin immediately after curing. 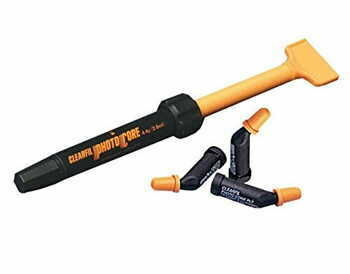 Photo Core PLT cures completely to a 9mm depth. CLEARFIL PHOTO CORE is an aesthetic light-cured hybrid composite which is heavily filled and especially developed for the construction of reliable core build-ups. The material cures completely to a depth of 9 mm in just 20 seconds which is unique. Thus clinicians are able to simplify their procedure by eliminating copper bands, matrix bands, and incremental layering, especially when using Kuraray Core Form.